One of the complaints frequently heard about very holy places in the world, is how crowded and commercialized they get. And indeed, our visit to the Jordan River last spring was hardly what you’d call “solitary.” In the dusty parking lot there were 20 or more tour buses, and room for about five times that many. When we got down to the murky, viscous waters of Qasr al-Yahud, one of the possible locations where John the Baptizer is traditionally thought to have baptized Jesus, groups from around the world were there. Some were gathered under large awnings, singing praise songs before heading down to the river; some were lined up in identical long white “baptized in the Jordan” souvenir T-shirts; and everywhere, was a cacophony of languages. It was a moment of choice: this could be a frustrating example of the commercialization of religion, or it could be an example of something else. As Shannon and I compared notes, we found that both of us were being deeply moved by this experience: by the place itself, by having our baptism reaffirmed by a clergy friend from Texas, and by being shoulder to shoulder with people from many nations who had gathered in the name of Jesus Christ. This was like the gathering from the four directions that our reading from Isaiah dreamed of: people of faith, called and led by a protective God, coming home to be transformed by the loving power and intention of the Holy One This place of pilgrimage was noisy, and claustrophobic, and utterly thrilling. Coming from a land where the good news of Jesus Christ elicits such apathy, it was such a delight to hear the varied accents and languages of believers from Italy, the Philippines, China, the southern states, and to physically see their boundless joy. Now, I am reasonably certain that when Jesus came to the Jordan to be baptized, the parking lot and souvenir shop were not yet here, but according to Luke’s account, the crowds were. Jesus did not swing a personal deal to be baptized in secret, away from the crowds, just in case something strange happened; he was lined up with the others, looking for a new destiny for their lives and better fortunes for their nation. In the verses just prior to our reading today, John was hurling insults, not only at the powers that be, but at the lineup of folks who had come for baptism, to make sure that they understood that this baptism was part of a program of societal reform, not just some hyper-personal magical event. (A program of reform which, by the way, would lead to both John and Jesus being put to death). And while you might think that this would repel the crowd, it did the opposite: it made John so popular that many people wondered if perhaps he was the Messiah they’d been waiting for, and it brought forth their questions about how to overcome this gap between the way things were and the way that God envisioned them being. So to soldiers John said, “rob no one by violence or by false accusation, and be content with your wages.” To tax collectors he said, “collect no more than is appointed you.” To the multitude he said, “if you have two coats, share with those who have none; if you have food and others do not, share with them.” (Luke 3: 11-14). In our cross-border book study this past fall, the writings of Marcus Borg (p.29) underlined how important it is to understand what scripture meant in its original context – so that what a Bible text meant in “their then” can speak to us in “our now.” In the days of the early Church, it was so important for people to understand the fullness of love that Jesus had, both to his people and to God, and for them to understand the connection between the mission of Jesus the Messiah, with the social and political reforms of John, the proclaimer. Luke wanted to make sure that the people of the early Church, facing such threat, knew the breadth and depth of God’s involvement in their lives, spiritual and practical, as they committed their lives to Christ. “In the midst of making that plunge [in the Jordan], Jesus discovers what he already knew, that he is God’s Beloved. This discovery becomes ours too. Not only is Jesus the beloved of God, but so are we. In the midst of the river we are given to in his name (the river we call Baptism), we learn that at the heart of the Universe our name joins his, flows into it, and flows from it, like water, like love. We are awash in the tumbling toward the sea journey of God’s love for us and Jesus’ love for God and, wherever it turns and twists, we are in that river of Lover and Beloved”. How important it is for that affirmation of belovedness to be heard and held by each of us. In our lives, in the lives of our loved ones, in the lives of neighbours both known and unknown, the baseline is LOVE. Not fear, not envy, not competition; LOVE. When everything else is stripped away, when we release our attachments to our possessions, our knowledge, our status, our entitlements, there is love, the connective power that integrates our lives and enlivens our communities. If those words of unconditional love aren’t words that you have experienced very much in your life, receive them now: you are beloved of God. And if you need to say those words to another, or to put the words into action, create room for that to be part of your practice going forward. God’s love speaks to and unleashes our best selves, reaching into our self-doubts and affirming a deeper truth. These are not empty words of false affirmation, but words of identity and resilient hope. I lament each case when deep hurt or traumatic circumstances or mental illness make it impossible for some to hear these words as true, but they are. “Their then” and “our now” meet, both in the ethical demands of the baptizer and the Christ, and in the foundational presence of love in our lives. And as much as that would be a neat and tidy place to leave things, I want to double back to the start of today’s message so that an important reality of our context does not get lost. An important step for us, in deepening our relationship with the Holy, however we define that, is to let these ancient words of belovedness seep into our lives. We hear of the love of Christ, expressed in word and deed, in life and death and new life, and that speaks to our lives; and we also make sure that we understand that little word “our” in the broadest possible terms. When I am presented with that wonderful affirmation, of God’s absolute love, I absolutely need that to become fully and personally real for me. And, I need to grasp that that same love is what connects me to all people and to all of creation. The same love that affirms my deepest being, motivates me to hear Christ’s call for change and compassion, to support all who long for health and wholeness, to advocate for broadly-experienced justice. Quoting one last time from Ian MacDonald (p.17), “All our lives we can flow into this mystery: how justice is the public face of God’s love.” That is true in the mission of this congregation, that is true for the actions of the United Church of Canada, that is true for the international throng on those slippery steps leading down to the River Jordan. As we are reminded each time we share communion, God’s declaration of love is not small or exclusive; the love that calls us to Table is wide, inclusive, universal. Everything I do, everything we do, happens within that great big varied, chaotic, amazing context of a world that is completely and wonderfully loved. God’s gift to Jesus – a declaration of belovedness – reaches across the millennia and beyond the nations. And so we come, to be renewed, to be changed, to be called, by the one whose love holds and defines our lives and the life of the world. Thanks be to God. Amen. Borg, Marcus. Being Christian: Why Christian Words Have Lost Their Meaning and Power—And How They Can Be Restored. San Francisco: HarperOne, 2011. MacDonald, Ian. Living Waters: Daily Reflections for Lent. 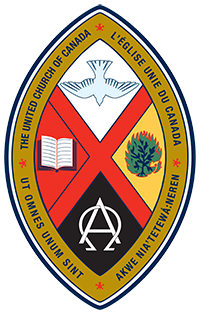 Toronto: United Church Publishing House, 2006. © 2019, Rev Greg Wooley, Ralph Connor Memorial United Church.